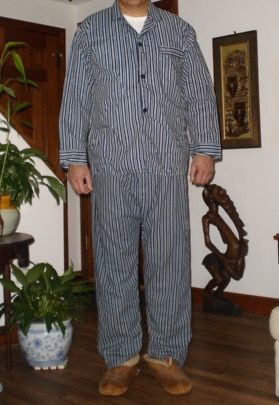 A set of pajamas being modeled. The face of the model is not shown because it is too shameful to be seen in a set of pajamas. Pajamas are the uniform for those who work at home. They are worn by those whose jobs are in their own apartment or house, who do their work strictly by telephone, internet, or any other means in which they have no physical contact with other human beings, who do not need to step outside as part of their job description. Most employers of at-home employees require pajamas to be worn to work. This has posed a challenge, because at-home employees are typically paid less than those who come into an office, and they struggle to afford their pajamas. Those who fail to meet this requirement are at risk for losing their job. No, they do not get fired by their bosses. But they inevitably end up quitting following the overwhelming temptation to buy normal clothing that is worn in the real workplace, which is then followed by the even more overwhelming desire to show it off to others. This can only be accomplished by going out and getting a real 9-5 job. Whoops! Maybe you were looking for Most awful stench in the whole wide world? It is very unusual for a set of pajamas to be kept clean. Typically, it is slept in, worn throughout the day, worn to bed the following night, and worn the very next day at work. This process is repeated day-in and day-out throughout the workweek and continues every week thereafter. It is for this reason that pajamas have a reputation for really stinking. Even the person wearing the pajamas cannot stand the odor, but this person is too lazy to wear anything else. After several days of use, the filth on pajamas starts to become invisible. This is because it covers up itself. The wearer has had so much coffee by now that they have been stained coffee color. This has been topped off with ketchup and mustard, along with grease from the fast food the wearer has had delivered to the door 300 times a day. All this food has caused the wearer to gain so much weight, the pajamas have been outgrown by now, but the wearer continues to wear them, only a little bit torn. The only reprieve from wearing pajamas comes outside of work hours. As the at-home worker learns to enjoy his/her life away from work more, s/he spends more time not wearing the pajamas, and wearing real fancy designer clothes that can be purchased for under $10 a garment at the local Wal★Mart or Target. Truth is, the at-home workers do not really like to work. They are lazy when it comes to work, but when it comes to something other than work, they have all the energy in the world. So they have plenty of opportunity to wear their tuxedos they bought at K-Mart and the used T-shirts and shorts they bought at Neiman Marcus. Whoops! Maybe you were looking for Maxed-out credit card? Pajamas are one of the most expensive types of garments on the market. Some at-home workers pay as much as $3-4 million for a single set of pajamas. There are some bargains out there to be found on pajamas if you look hard enough at a clearance sale or maybe on eBay or Craigslist. If you find a set for perhaps $700,000 or so, you are in luck. Of course, there is the option of using what is called the poor man's pajamas. This is composed of an old jogging suit or similar outfit that is no longer presentable to wear outdoors. Of course, you do not want your boss to know about that. So if you are wearing a set of poor man's pajamas, be careful to keep your 3G network turned off, and don't use Skype.